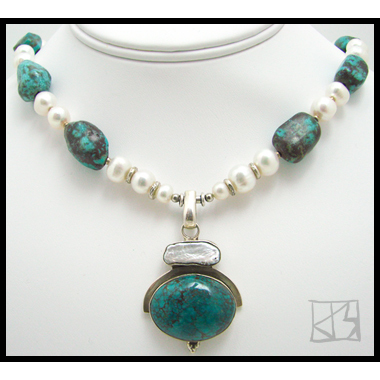 Natural untreated dragonskin turquoise is the focal point of this one-of-a-kind piece! I love working with the contrast found in dragon skin turquoise, its varying greens and blues with fascinating veins of dark matrix. 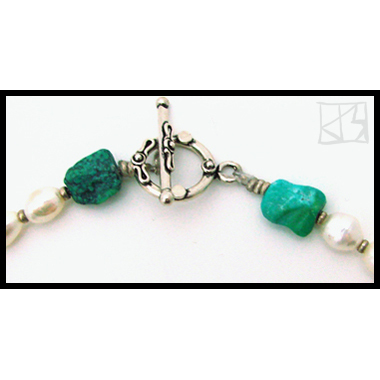 The pendant itself is a quiet statement of contrasts: sterling silver geometry frames this organic turquoise cab and elegant freeform biwa pearl. 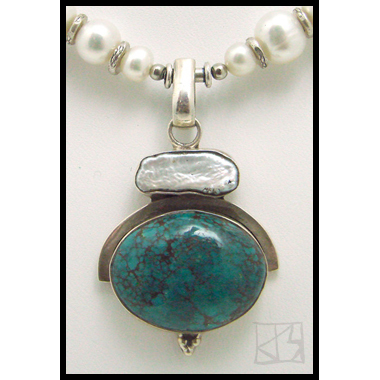 A balance of white pearls, matching turquoise nuggets and fine sterling silver � crafted in both Bali and Thailand � enhance the fabulous centerpiece. Both elegant and organic, this unique piece will do double duty in your collection.